By Vincent Morgan	| Published on Friday, May 21, 2010. - A graffiti mix by Dj Bachir. 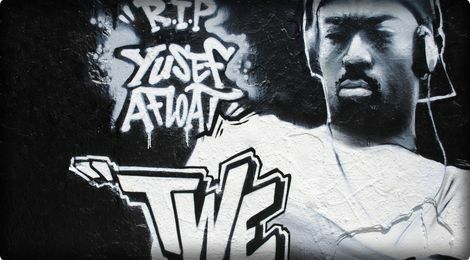 - A wall made by the TWE crew dedicated to the group the Nounce. Bachir offers FatCap readers a wonderful graffiti mix. The idea was to mix tracks dealing with graffiti and tracks which album covers were designed by a graffiti artist. The link between rap and graffiti is strong. Some album covers became real references, even collector's masterpiece as the cover album of "Beat Bop" by Rob Rammelzee & K, which was realized by Basquiat. Here are the covers and the tracklist of Bachir's mix. Enjoy 50 minutes of audio graffiti. Download the mix here or here . More about The Nonce and the Dj Bachir Mixtape, "The only Mixtape. "This mix is a wonderful introduction to one of the most talented mc's/producers to ever come out of los angeles!" Omid Walizadeh a.k.a Dj Omid. Nouka Basetype and Yusef Afloat met while on the bus from their South Central hood to El Camino High School in the Valley. As The Nonce the duo release a gang of solid records from 1992 to 1999. Part of the burgeoning scene of the Good Life, The Nonce where signed to Morris Taft's indie label Wild West in 1991. Their second single Mixtapes benefitted from much exposure when Wild West signed a distribution deal with Rick Rubin's Def American. While Mixtape became a hip-hop classic, their label never managed to take them to the next level and offer them the mainstream recognition that they deserved. Far from being commercial they had songs for the ladies ("Bus Stop"), they had the catchy choruses ("I used to sell mixtapes, but now I'm an MC") and all. Despite major push from their label, they never made it big. The Nonce not only had rhymes but they also crafted nice jazzy beats for fellow Good Lifers like Aceyalone, Supherb, Ganjah K, HSD. Nouka & Yusef stayed together until death did them part. In may 2000 Yusef Afloat was found dead alongside a freeway. What happened exactly is still a mystery, as explained in the documentary This Is The Life. Under the name Sach, Nouka kept doing music by himself and for others. While The Nonce never had the props they deserved it's now time to show them some appreciation in the form of a Mixtape. This mix is just a little foray into the catalog of Sach and Yusef Afloat. And if you enjoy this selection, don't hesitate to dig a little deeper, there is no way you can be disappointed by The Nonce.